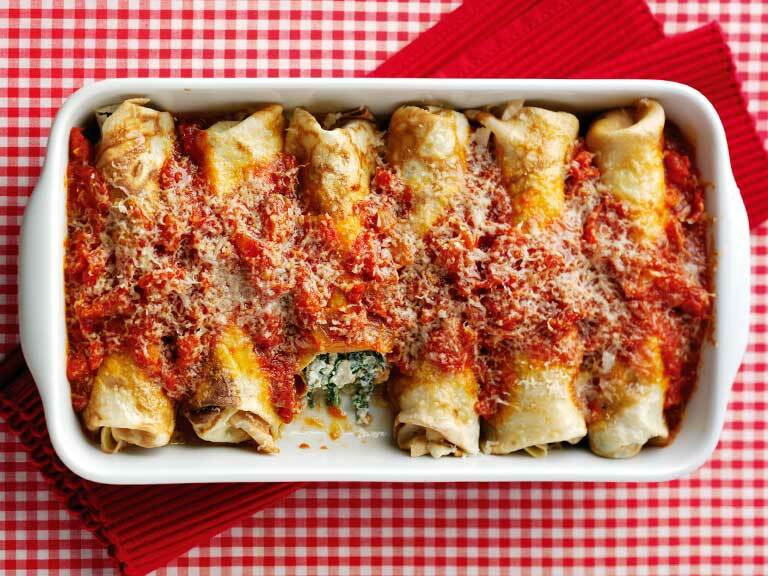 The Italian equivalent of crêpes are served here stuffed with a creamy spinach and ricotta filling and baked in a tomato sauce. 2. Heat a 20cm/8in diameter non-stick frying pan until hot, drizzle a little oil over the centre and wipe around the pan with a piece of kitchen paper. Pour a little of the batter into the pan and immediately tilt the pan to spread the batter evenly over the base of the pan. Cook for 2 minutes or until the top is set and the base golden. Flip over using a spatula and cook for a further 1-2 minutes or until the base is golden. Make another 7 pancakes in the same way and set aside. 3. To make the filling: heat the oil in a medium pan, add the onion and sauté until soft - about 4 minutes. Add the garlic, then spinach and squash down into the pan. Cover with a lid and cook for 4 minutes or until the leaves are wilted. 4. Tip the spinach into a sieve and press out the excess liquid. Tip into a bowl and mix in the ricotta, half the Parmesan, nutmeg and plenty of salt and pepper to taste. 5. Lay the pancakes out on the work surface and divide the filling between them spooning it down the middle of each. Fold the sides over the filling, then roll up the pancakes. Place seam side down in an ovenproof dish. 6. Preheat the oven to 200C/400F/Gas Mark 6. Spoon the sauce over the top of the pancakes, spooning it in a line down the centre of the pancakes. Sprinkle over the remaining Parmesan cheese. Bake for 20 minutes or until piping hot and crisp. Serve hot with a crisp salad.